Google CEO Sundar Pichai said even if he was not the chief executive of the internet search giant, he would still have been building software products. India-born Pichai revealed this in response to a question asked by a student during a Q&A session at SRCC in Delhi University. He is on his first trip outside the US since becoming the CEO of Google. Talking about where Pichai sees Google in next 30 years, he said he hopes that the company is still working on products that solve problems for the whole of humanity. He added this ethos of helping humanity using technology is why he was drawn to Google in the first place. Responding to a question on how his vision for Google differed from that of company co-founders Larry Page and Sergey Brin, Pichai said that he shares the same aspirations for the company as the two founders. Therefore, he shares most approaches in problem-solving with them than not, even though there are some differences of opinion. Answering why Google has never named Android after an Indian dessert (all Android versions are named after desserts), Pichai jokingly said the company may hold an online poll while naming the next version of the mobile OS. Responding to host Harsha Bhogle's question about how Google plans to stay relevant in this time of change, Pichai said everything changes at a fast pace in the world of technology and there is a need to keep reinventing to remain relevant. He said the PCs were just getting underway in the 1980s, while internet as we know it came into being 10 years later. A decade later came smartphones and Android was not even in the market at the time. So reinventing itself and keeping abreast of change will help Google remain relevant in coming times. 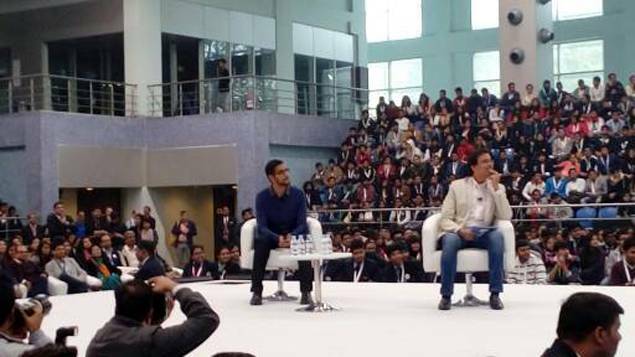 Talking about the current startup scene in India, Pichai said he had been waiting for this change in the country for many years and finally felt it when he visited India last year. He said the quality of ideas by Indian startup founders is the same as that of entrepreneurs in Silicon Valley and that India is well positioned to become the Silicon Valley of the East. Pichai added that failure is not to be ashamed of and should be taken as a learning instead. He said failed startups in Silicon Valley are considered a badge of honour due to the lessons the founders learned from the journey.